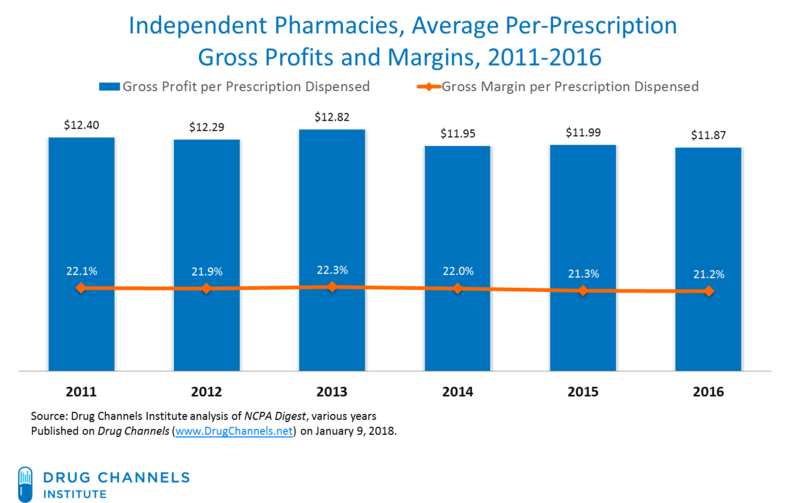 Time for my annual look at independent pharmacy owners’ business economics, drawn from the recently released 2017 National Community Pharmacists Association (NCPA) Digest, Sponsored by Cardinal Health. Here's the press release: NCPA Releases 2017 Digest. Below, I review our latest estimates on pharmacy economics and margins. Our analysis reveals that independent pharmacy owners are now performing poorly. In 2016, we estimate that the average pharmacy owner saw their salary decline by more than 20%, to about $156,000. The number of independent pharmacies and gross margins also are trending downwards. It’s the third consecutive year in which owner’s compensation declined. Read on for my look at pharmacy profits, comments on the industry’s competitive dynamics, and advice to pharmacy owners. When times were good, pharmacy owners and their lobbyists complained bitterly about low pharmacy profits. Now that the endgame is truly beginning and reality matches the rhetoric, don’t be surprised that policymakers and others are skeptical. The 2017 NCPA Digest, Sponsored by Cardinal Health publishes summary 2016 financial and operating data submitted by pharmacy owners. Today’s post marks my ninth annual review of the digest’s data. The NCPA's Doug Hoey published his summary in 2017 NCPA Digest: A roadmap for independent community pharmacies. These data have strengths and weaknesses. They do, however, provide the only publicly available, consistently published look at the financial position of independent pharmacies. I don't have access to the complete financial benchmarking report, so some of the figures below are our estimates. BTW, NCPA still collects detailed financials, but it wouldn't share the data with me. I guess NCPA has a gag clause to prevent external analysts from examining pharmacy-owner economics. Oh, well. A pharmacy’s revenues come from prescription drugs, over-the-counter products, vitamins, cosmetics, groceries, and other merchandise. A typical independent pharmacy generates more than 90% of its revenues from prescriptions. Gross profit equals a pharmacy’s revenues minus the costs of products (net of discounts and returns) bought from a manufacturer or a wholesaler. Gross margin expresses gross profit as a percentage of revenues. Gross profit equals a pharmacy’s revenues minus the cost of products (net of discounts and returns) bought from a manufacturer or a wholesaler. Gross profit measures the portion of revenues available for operating expenses and operating profit. Operating expenses include: (1) payroll expenses—the wages, taxes, and benefits paid to the pharmacy’s staff, including the business owners, and (2) general business expenses—everything else needed to run the pharmacy, such as rent, utilities, licenses fees, insurance, advertising, and other business costs. Operating income equals gross profits minus operating expenses. To be profitable, a drugstore’s gross profits must exceed its operating expenses. For example, a pharmacist-operated drugstore could report an apparent “net loss” if the pharmacy owner chose to pay himself or herself a larger salary instead of reporting a positive net profit. Owner's discretionary profit (ODP) equals the sum of owner compensation plus operating income. Thus, ODP encompasses two of the three ways a pharmacy can spend its gross profit dollars. The NCPA Digest used to publicly report the ODP, but has hidden the figure since 2013. For more on pharmacy and prescription economics, see Chapter 10 of our Economic Report on U.S. Pharmacies and Pharmacy Benefit Managers. 1) Overall independent pharmacy profit margins are trending downwards. In 2016, independent pharmacies' overall gross margin from prescription and non-prescription products was 22.1%. The margin has dropped 190 basis points since its peak of 24.0% in 2010. This year’s findings differ from U.S. government statistics, which show increasing gross margins at chain and independent drugstores. In 2015 (the most recent year for which data are available), the drugstore industry’s overall average gross margin, as reported by the U.S. Census Bureau, was 27.1%. 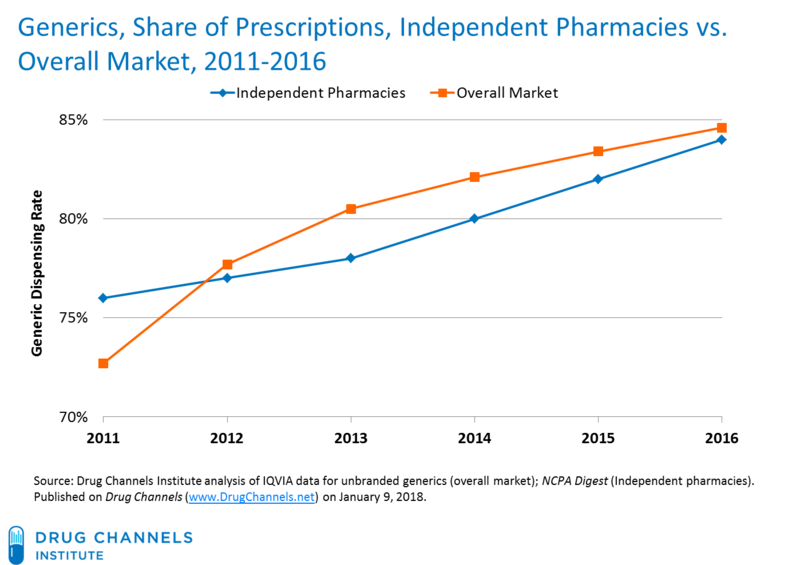 (source) The industry margin is higher than the independent pharmacy margin because higher-margin non-prescription front-end products account for a higher share of sales at chain drugstores. 2. 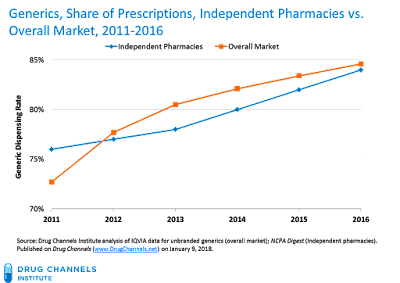 Independent pharmacies’ prescription profit margins also keep trending downward. NCPA no longer publicly reports gross margins on prescription vs. non-prescription sales. 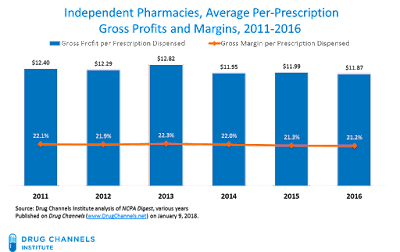 However, we estimate that gross margins on prescription sales were 21.2% in 2016. As you can see in the chart below, these figures have remained fairly stable, but they have declined over the past four years. In 2016, average per-prescription revenues in the NCPA sample decreased to $55.99, compared with $56.37 per prescription in 2015. Combined with the decrease in gross margin, gross profit dollars per prescription dropped by 1.0%, from $11.99 per prescription in 2015 to $11.87 per prescription in 2016. 3. Independent pharmacies’ generic dispensing rates are getting closer to—but still lag—that of the overall market. In recent years, the NCPA digest has recorded an odd discrepancy. For independent pharmacies, the generic dispensing rate (GDR)—the percentage of prescriptions dispensed with a generic drug instead of a branded drug—lagged that of the overall market from 2012 to 2015. For 2016, the gap became smaller. The GDR for unbranded generics in the overall market was 84.6% in 2016. As the chart below shows, the GDR for independent pharmacies was 84%. It’s still not clear to why the independent market underperforms in generic substitution. 4. The average pharmacist owning a single pharmacy earned about $156,000 in 2016—down for the third consecutive year. In this year’s sample, average annual prescription volume per pharmacy dropped by 1.2%, to 59,746 prescriptions, in 2016. Combined with the slight decline in gross margin, this resulted in lower compensation for a pharmacy owner. I estimate that the Owner’s Discretionary Profit (ODP) dropped for the third straight year. On a per-pharmacy basis, this figure shrank, from $200K in 2015 to $156K in 2016. From what I can tell, about half of the earnings decline can be attributed to higher payroll costs. The remainder is due to the lower revenues and gross profits in the NCPA sample. Note that a pharmacy owner still makes more than an employed pharmacist—but the gap keeps narrowing. See Average Pharmacist Salaries Hit $120,000, but Growth Again Lags Other Healthcare Professions. 5. 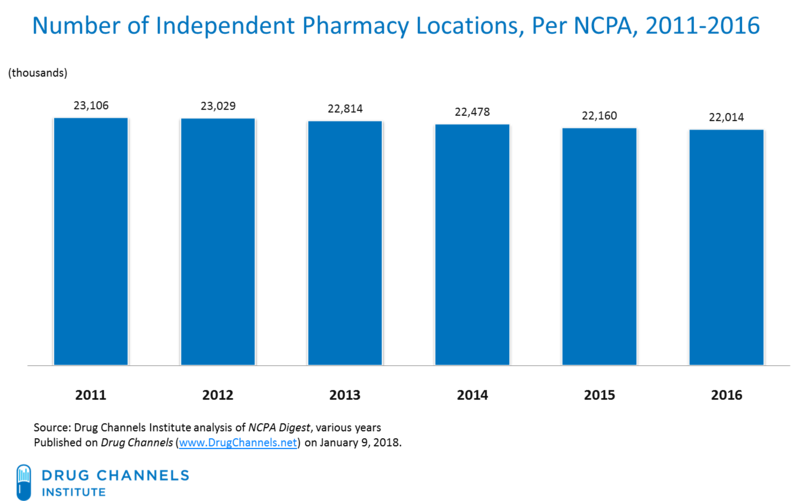 By the NCPA's count, the total number of independent pharmacies is slowly declining. Owning a pharmacy entails additional risks and hassles compared with being an employee. 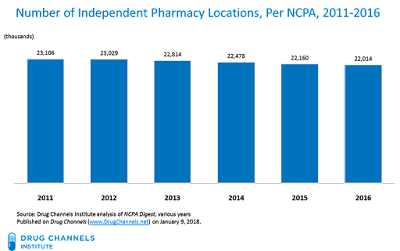 Consequently, according to the NCPA’s counting, the total number of independent community pharmacies has been relatively stable. The data do, however, show a slight downward trend since 2012. The chart below shows the NCPA figures since 2011. IQVIA data show much more stability in overall independent pharmacy numbers. I can’t figure out the discrepancy. A pharmacy’s cost structure encourages this price competition. For a typical pharmacy, total annual operating costs do not vary based on small variations in the total number of prescriptions dispensed. Consequently, the marginal (incremental) cost of dispensing one extra script is very low. Pharmacies therefore have incentives to reduce their gross margins in exchange for growing (or even maintaining) market share. That’s why the reduction in pharmacy profits is the biggest source of cost savings from narrow networks. 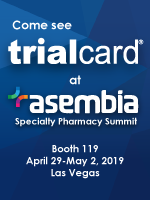 It’s also why acquisition cost reimbursement can often be better for pharmacies. Pharmacy owners should do more than merely blame others—PBMs, Medicare, health plans, manufacturers, Illuminati, bloggers, et al—for this state of affairs. Instead, I encourage pharmacists to recognize and understand the fundamental competitive economics of today’s pharmacy industry. 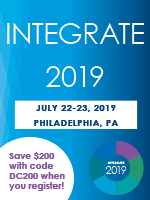 Consider the lessons of other retail industries that I describe in Shopping for Prescriptions: How Deductibles Will Reshape the Pharmacy Industry. My core advice to pharmacy owners from last year’s analysis remains true: Get Big, Get Focused, or Get Out.